Forty steel-wire hoops, eleven white linen tapes. One of the most characteristic features of fashion during the middle of the 19th century was the crinoline style, using crinolines incorporating steel hoops. Skirts began to swell out in the 1830s, initially by layering petticoats to create the extra volume. This was inconvenient, so in the early 1840s, the crinoline petticoat was developed, originally made of linen and interwoven with horsehair ("crin" in French) to provide enough stiffness for a single petticoat to easily swell out a skirt. 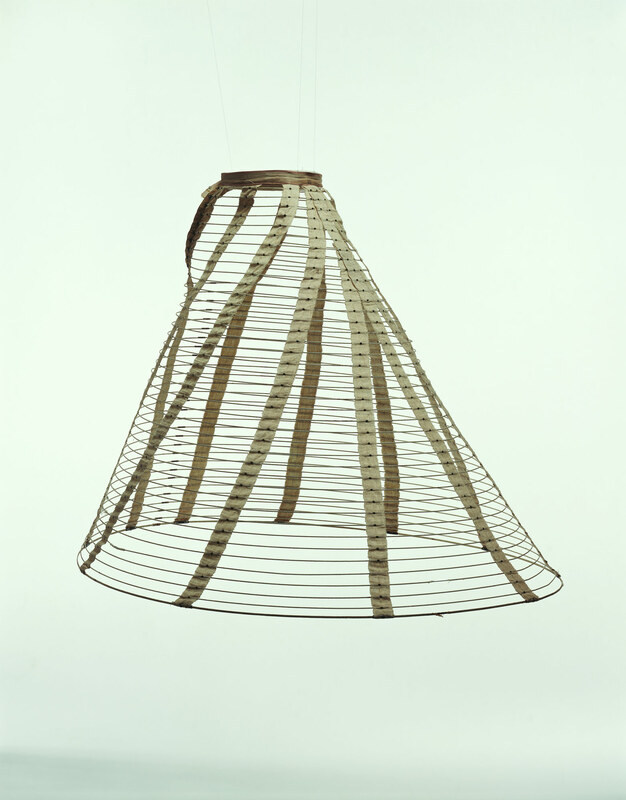 In the second half of the 1850s, a cage crinoline was patented that linked together a series of horizontal hoops made out of wire or whalebone. Further progress led to the use of steel hoops, resulting in crinolines that were lightweight and easy to put on or take off. This development led to a sudden trend for massive skirts, which reached their maximum size in the 1860s. As the structure of this exhibit shows, the crinoline technology continued to play a part in the subsequent bustle style.